HALLIE EPHRON: Writers everywhere got a giggle out of a widely copied headline from The Oregonian celebrating the debut of the Oakland A's switch-pitcher Pat Venditte. From Snopes.com: "Oakland A’s reliever Pat Venditte may be able to throw with either hand, but he can’t pitch underwater." The Washington Post quipped: "... well, let’s just say he made a splash." It reminded me of a sadder news story I'd read a few weeks earlier about a victim who was "killed by a rouge bullet." And in my own writing, there was the time I was talking about a bowls and instead wrote bowels. Fortunately someone (not me) caught that before it went to galleys. Have you made some interesting "typos" in your manuscript? Are there words that trip you up? 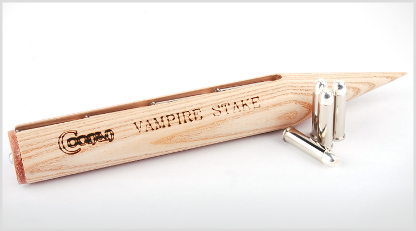 SUSAN ELIA MACNEAL: It's so funny that you put this up — only this morning I was having a steak/stake moment — yes, I was talking about a metaphoric vampire, so it was stake — but does the "steak" mean I'm unconsciously hungry? Tired of mostly vegetarian life? What should I make for dinner? And I always have to remind myself about "Hear! Hear!" as opposed to "Here! Here!" HALLIE: Is it "Hear! Hear!" -- really??? And what about "making due" or is it "making do"? I could go either way. And "cut the muster" or "cut the mustard"? But is it carrot AND stick approach? Or is it: carrot ON A stick approach? 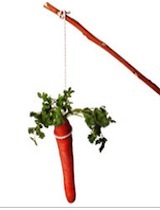 Or is it: carrot or stick approach? And don't even get me started an effect and affect. I men, I understand it, I do. I just can't remember it. And it ALWAYS sounds so wrong..I just avoid it. It's like one of my (very funny but strangely-educated) pals once said to me-- "This is SO difficult! I't like Godot pushing that boulder up the mountain." DEBORAH CROMBIE: Hank, it's "Carrot AND stick." Because you use both to get the donkey to do what you want:-) And Sisyphus! How funny. "Discrete" and "discreet" get me every time. I think it's because I was a biology major, where "discrete" means "apart of detached from others." So confusing. And "affect" and "effect." But then I have the British stuff to contend with, too, like "inquiry" and "enquiry." Ack. Oh, what is the "pale", by the way? And why are we beyond it? HANK: But I always imagine the carrot hanging from a string tied to the end of the stick, and the rider holds it out in front of the mule, and the mule keeps walking toward the always-ahead-of-him carrot. Carrot ON a stick. which is still, carrot and stick. And string. But you are not whapping the mule with the stick. RHYS BOWEN: I have always struggled with spelling (unlike my friend who got a stoke of the cane for every word she got wrong and was thus a terrific speller. I also have to battle with Transatlantic differences. Draft versus draught. Discrete is a big stumbling block for me. Affect/effect also really have to think through that one every time it comes up. Don't you think that soon English will be purely phonetic and thus none of this will matter? I can answer the Pale question. In the middle ages villages had a fence of stakes (not steaks) around them and that was called the pale. If you were beyond it, you outside society. BTW a pet peeve of mine is the use of "outside of"
HALLIE: So what words and expressions trip you up? And Susan, I hope you'll share what your friend was trying to say when she used vestigial instead of vaginal, or was it the other way 'round? Rhys, that's brilliant! I never knew the origin of "beyond the pale." And I'll never hear the play title WAITING FOR GODOT without thinking of Sisyphus. Don't we love words and language? I've been known to mix up "bear" and "bare." Actually, there are days when the word "cat" doesn't look right. Anyone here familiar with the wonderful book "Lost in Translation?" It is lovely! An illustrated book featuring words from other languages and cultures that have no English translation. These are awesome. There's a name linguists use for some of them: eggcorns. "An incorrect yet particularly suggestive creation". First occurrence: A mighty oak does from an eggcorn grow. There's a database of them: http://eggcorns.lascribe.net/ "For all intensive purposes" is one, as is "cold slaw." Browse the database - it's infinitely entertaining. Eggcorns? I love it. Thanks for that, Edith. Kaye, I'm going to have to look for that book. And my same friend said: "I don't care, It's Six of one, a dozen of the other"
This one is just me, I think, but whenever I need a big rescue at the end of a story, I keep bringing in the calvary. No, that's a hill, Mr. Getze. You want Cavalry. Horses. Ok, I got it now. I want it to be cold slaw. Jack, I think calvary is like nuculer... it's the way some people say it. Compliment/complement. This just annoys me when I see the words used incorrectly. Maybe that makes me an egghead, er, eggcorn. Lately, I've been having trouble with trial and trail. Clearly I know the meaning of each, but for whatever reason, my fingers don't want to obey. And then when I proof it, my eyes just pass right over it. First and most important: Hallie, I sat down to read a little of Night, Night yesterday. Three hours later - yep, finished. Brava! You made me think all night of how I felt about the ending, which is terrific. Words, ah words. I have two English degrees. I work in technical communication. I was a college journalist and an editor. I'm still an editor at heart. So I cannot read without subconsciously correcting spelling and grammar. That baseball headline? I shook my head over that for days. I spell check my texts, emails, Facebook posts, blog comments. And nothing, nothing makes me more embarrassed than hitting "send" or "post" and noticing a typo. But that's me. I'm sure I make them (just ask my critique partners and editors), but I really try not to do so. The more professional the publication (e.g., newspapers), the more frustrated I get. Misuse of "e.g." and "i.e." is another one that gets me. Oh Mary, THANK YOU! Your comment made my day. And night. I try not to use e.g. or i.e. at all. Why not say "for example" or "in other words" (unless you're tweeting and each character matters) or writing a scientific/technical paper and need to look smaht. I don't make typos, I tell myself, it's my keyboard. And sometimes it really is! Hallie, I saw something in the NYT the other day that made me gasp in shock and reread it. I couldn't believe the Times had made such a mistake. But I didn't write it down, and now I can't remember what it was. Arrggh. Next time, I'll write it down. Hank, I dreamed of your mule and carrot. You are, as always, priceless. Edith, "eggcorn" has now joined my vocabulary! I'm usually the one secretly correcting others by saying to myself, "The proof of the pudding is in the tastING" or "You've got another THINK coming" or "Music HATH charms to soothe the savage BREAST." Then when I'm alone with my kids I rant about this degraded world and make them promise to never, ever use "impact" as a verb. Impact: the verbing of nouns. That's a whole 'nother discussion. Some I love (P. L. Travers talks about one of the children in Mary Poppins "trapezing" across the room. Ugh. The verbing of nouns. In the corporate world, I often have to physically restrain myself. "We need to figure out how to make this feature more impactful." Gah! My ears! I'm with you, Mary Sutton. Cannot read anything without subconsciously correcting typos and misuses. The other night I was reading a short story and there were three before the end of the second page, and I threw it down in disgust. Yanked me directly out of the tale. I can never remember whether there is a second "e" in "judgemental" or not. Judging by the wiggly red lines, there isn't; it should be judgmental. Thank goodness for those lines! Spoken language quirks I've noticed lately: "expecially", instead of especially, and "excetera", instead of etcetera. Goes along with nuculer and calvary. Not to mention "aks". Cloths and clothes: the plural of "cloth" is "cloths"; "clothes" are what you wear. I do that correcting when I'm watching TV and listening to the radio, drives my husband crazy. I try NOT to do it when talking to my kids. 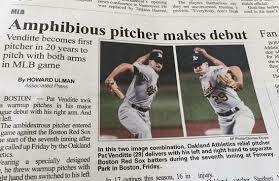 I'm laughing at amphibious pitcher and can't seem to stop. Oh my. Good one. Of course, in my writing I deal with things amphibious since I write diving mysteries. And that brings me to one of my errors that nearly made it into print. My protagonist found a pair of diving sheers inside a the cabin of a wreck. Must have been a well-decorated place! Hmmm, I am pretty sure that it is carrot OR stick. And this is the reason why It is all about getting someone to some thing to act in a particular way. For instance, think about dog training. You can offer the dog a reward for good behavior, such as a treat or a pat on the head, an "atta boy." This is where the carrot comes in, although my dogs hate carrots. Or you can punish the dog for poor behavior, using a sternly voiced BAD DOG. This is the stick analogy, and I hope none of us actually hit our dogs. So it is an either/or thing, the carrot or the stick. Oh crap. Someone please put a period after "why" and remind me to proof before I publish. One of the most startling instances of this sort that I ran across some years ago was a reference to a heroine's "taught abdomen." As you might imagine, I was immediately distracted from the story itself to wonder about the curriculum and a possible degree program. I'm one of those English nerds that actually enjoy reading a grammar book. I'm sure that affected my decision to major in English in college. However, I recognize how irregular our rules of grammar are, so I try not to judge too much. I do think people should know the differences of there, their, and theyre . Two, too, and to should be a no-brainer, too. There are some mistakes that are just lazy. Of course, with the irregularity of our language, I understand many of the mistakes. Effect and affect are words I've always taken pride in using correctly, but if you look deep into the usages of these two words, even those of us who consider ourselves well versed in them will shudder at the exceptions. And therein is the reason so many people fear grammar. Exceptions! Your student has a breakthrough of understanding, and after rejoicing with him/her, you utter those damning words, "Now the exception to that is..."
The verbing of nouns doesn't bother me as much as it probably should. With our language always being in a state of flux, as languages through the ages have been products of an evolving nature, we have to adapt to language of convenience, which verbing nouns are, although a case could be made for these nouns being a lazy tool of communication. Hallie, I like the "trapezing across the room," too. Edith, I love the addition of eggcorn to my vocabulary! And, Rhys, I'm delighted to know where "beyond the pale" has its origin. Language is a fascinating siren, charming me and gobsmacking me with its overt and covert intentions. carrot-or-stick The word you've entered isn't in the dictionary. For some reason I have no trouble with affect/effect. Lie/lay/lain I will never understand. Once saw a reference in a novel to "rod iron." Sensible but incorrect. Ann, I completely understand, and it makes total sense. Still, I like carrot on a stick. You have to give the mule the carrot when you get there, of course. Hank, carrot on a stick sounds like state fair food. I find people have trouble with loose and lose. What is wrong with orient as a verb and how did it turn into orientate? I hate orientate. First line of a poem I should write. Taught abdomen is great; I wish I had taught mine how to be taut. I once listened to someone's spiel about health products and she ended with how it could youth-a-nize you. I told her people would think you're saying euthanize and that is not a selling point. I forgot this one: aquiline eyes. How does that work? I never confuse the meanings of these two words, but for no logical reason, I always mix up the spelling: a person can be wary, but a mood can be eerie, not eery. Aquiline eyes... for a moment it looked fine to me. Then I looked it up. Eagle eyed? A mood can be eerie a place can be an aerie... where those aquiline eyes go to rest. The fourth and fifth graders with whom I read just shake their heads over what we label "silly words"
that look the same and are pronounced differently and have totally different meanings: The wound on his hand was infected, but he wound his watch using that hand. He took the lead in positioning the lead pipe in the trench. And those words are spelled differently with different meanings that sound nearly the same: hours, ours; to, two, too; hair, hare, heir; their, there. For many of them, English is a second or third language. They often point out to me that their first language has much less confusion! Given too much thought, it seems a wonder that we understand each other at all! I do love eggcorn, though. It sounds charming! I may have to start using it, even if it's not a word! They even have a graph showing usage from 1800 to the present. Officially: either is "correct" but chest is far more common. Ah, we do have a difficult language, especially for those with spelling disabilities, for whom even spell check is only minimal help. We used to advise some students to cultivate friends to proofread for them. I've seen the bowl/bowel error in another book as well; let's blame auto-correct, a mixed blessing. Knowing the right words to use doesn't guarantee that my fingers will hit the right keys. I was a secretary for Prudential right after college. When teaching jobs finally became available again, one of my students looked at one of my blue dittos and said, "I see why you aren't a secretary any more." Teaching jr. high students the lie/lay/laid conjugations is a real challenge. Oh no! "Orientate" makes me crazy! But isn't it common in the UK? I am such a grammar nerd. It's gotten so bad lately. I think I must be reading some self-published books that have no editors. There are so many grammar errors in them! There's Pale in Irish History. It was the area under English law. There was no intermarriage with the Irish and other laws. 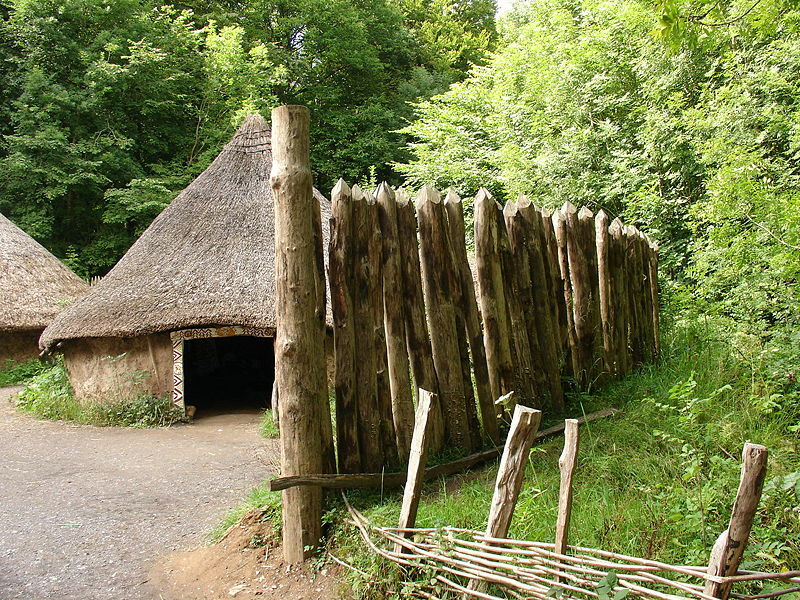 If you lived ouside the English-controlled area, Outside the Pale, you were considered a savage. How many ways can you say/spell voila?! Wahlah, walla, wallha, have seen them all. Another phrase that drives me nuts, "same old, same old", when they say, "same o, same o"! I'm not the spelling or grammar police, but do see many errors in print! I never knew about beyond the pale, but now I do. Hallie, don't forget to add pique to the peek/peak on your list. It's a triple, and you get more points. In junior high, our English teacher gave an assignment/contest (no prize only glory) to compile a list of homonyms, She assigned partners for this. My partner, one of the less linguisticlly skilled students,and I won with something like 85 pairs/pears in 45 minutes. This was back in the days of pencils and tablets so writing them took time away from thinking of them or we probably would have had more. Homonymania (our term) was a game my husband and I played with our daughters from the time they learned to read and still do play on occasion. It has led to some very interesting puns. Now we have spell check or autotype which often adds to the fun when reread especially after you've hit send. "Free reign" never makes me fail to say "aaaaargh!"